Back sometime last winter, I cracked a bottle of wine that I'd been sitting on for a while, but I was very hesitant leading up to pulling the cork. Well, eagerness finally won the battle over patience that night, but I do have to say that the little voice did us well. The wine was stunningly good - easily one of the top bottles of Beaujolais I've ever had, one that would show up many a 1er Cru Burgundy. There was only one tiny problem, though - as good as it was, it was, at best, just beginning the climb to its apex. It easily had another 3-5 years before its prime. But it was still good enough that it the enjoyment overshadowed the regret over being a bit too early. 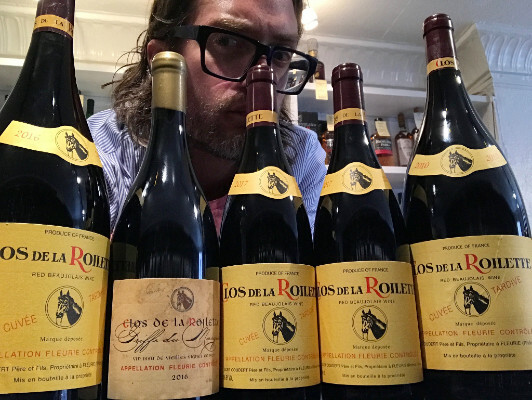 So, the reason I tell this story is because today's the day that I'm offering the newest flock of releases from Clos de la Roilette, their Fleurie 2017, Fleurie Cuvée Tardive 2017 and Fleurie Griffe du Marquis 2016. Sometimes I look around the shop and say, 'Man, I've got a lot of Roilette in here.' And then I think about bottles such as that 2010 Griffe, and then remember that it's because I like it so very much. Of all of the producers from that initial wave of Cru Beaujolais 15 years ago who are now household names, I still find Roilette to be my personal favorite - the wines are delicious, first and foremost, but the intensely mineral, firmly structured profile is stylistically very unique and, as I've mentioned many times, the wines age beautifully. So here we are, with the Fleurie and Fleurie Tardive from the lifted, but intensely structured 2017 vintage and Griffe du Marquis from the lovely, jovial 2016 vintage. I'll cut to the chase, both of the '17s should be given cellar time, the Tardive especially. This is a vintage of fierce structure and, both wines will certainly be enjoyable now, but they'll definitely give you a little attitude back. The basic Fleurie is, yes, the friendlier of the two, but make no mistake...this wine is going nowhere fast. With the Cuvée Tardive (the old vines bottling), that tight grip and hyper-mineral character emerge even more strongly. This one's always a little grouchy in its youth, but if you let it come into its own, it emerges as a serious, yet deeply artistic version of Gamay. Finally, there's my favorite (and least available) wine of the lineup, the Griffe du Marquis 2016, which is the exact same wine as the Tardive, but it's raised for an extra year in old Burgundy barrels. This imparts a more polished, but no less serious structure to the wine and also, for me, emphasizes the feminine side of that darker, mineral-packed Gamay fruit. This is, in my opinion, the most complete bottle of Beaujolais on the market. 2016 is a much more generous and elegant vintage than 2017, but that's not to say that the Griffe is a 'drink now' candidate, so bury it deep and forget about it as long as you can. If there are any bottles left at the end of this offer, I certainly plan on snagging some for myself to enjoy sometime down the line when that voice of patience again finally loses out to the voice of excitement.